TSH receptor (TSHR) autoantibodies (TRAbs) play a key role in the pathogenesis of Graves’ disease. In the majority of patients, TRAbs stimulate thyroid hormone synthesis via activation of the TSHR (stimulating TRAbs, TSHR agonists). In some patients, TRAbs bind to the receptor but do not cause activation (blocking TRAbs, TSHR antagonists). Isolation of human TSHR monoclonal antibodies (MAbs) with either stimulating (M22 and K1-18) or blocking activities (5C9 and K1-70) has been a major advance in studies on the TSHR. The binding characteristics of the blocking MAbs, their interaction with the TSHR and their effect on TSHR constitutive activity are summarised in this review. In addition, the binding arrangement in the crystal structures of the TSHR in complex with the blocking MAb K1-70 and with the stimulating MAb M22 (2.55 Å and 1.9 Å resolution, respectively) are compared. The stimulating effect of M22 and the inhibiting effect of K1-70 on thyroid hormone secretion in vivo is discussed. Furthermore the ability of K1-70 to inhibit the thyroid stimulating activity of M22 in vivo is shown. Human MAbs which act as TSHR antagonists are potentially important new therapeutics. For example, in Graves’ disease, K1-70 may well be effective in controlling hyperthyroidism and the eye signs caused by stimulating TRAb. In addition, hyperthyroidism caused by autonomous TSH secretion should be treatable by K1-70, and 5C9 has the potential to control hyperthyroidism associated with TSHR activating mutations. Furthermore, K1-70 has potential applications in thyroid imaging as well as targeted drug delivery to TSHR expressing tissues. TSH receptor (TSHR) autoantibodies (TRAbs) play a key role in the pathogenesis of Graves’ disease and are detectable in almost all patients when measured using sensitive assays [1–4]. There are two types of TRAbs; in the majority of patients TRAbs bind to the TSHR, mimic the biological activity of TSH and stimulate the cyclic AMP pathway and thyroid hormone synthesis (stimulating TRAbs, TSHR agonists). In some patients, TRAbs bind to the receptor but do not activate the cyclic AMP pathway, and act as TSHR antagonists (blocking TRAbs) [1–4]. The main feature of TRAbs with thyroid stimulating or thyroid blocking activity is their high affinity binding to the TSHR and their ability to inhibit TSH binding to the receptor [1–4]. To understand the key role of TRAbs in the pathogenesis of Graves’ disease, different laboratories tried to isolate human TSHR monoclonal autoantibodies (MAbs) or to produce animal MAbs that would have at least some of the characteristics of human TRAbs [2, 5, 6]. MAbs with strong thyroid stimulating and TSH binding inhibiting activities were eventually produced in mice and hamsters [7–11]. At least, some of these MAbs showed high binding affinity for the TSHR and competed effectively in a dose-dependent manner with TSH and each other for binding to the TSHR. In addition, patient TRAbs with stimulating or blocking activities inhibited MAb binding to the TSHR . Mouse TSHR MAbs with the ability to block the stimulating activity of TRAbs and TSH have also been produced and characterised [10, 12]. Earlier, mouse TSHR MAbs which just blocked stimulation by TSH (i.e., not effective blockers of TRAb stimulation) were produced [2, 13–21]. However, one of the most challenging goals in thyroid research was to isolate human autoantibodies to the TSHR with the characteristics set out by McLachlan and Rapoport [2, 5]. These characteristics included: (1) the MAbs should be of IgG class, (2) the MAbs should be active at ng/mL concentrations (show high binding affinity for the TSHR), (3) the MAbs activity should be removed by incubation with the specific antigen (TSHR), (4) the MAbs should be active when purified to homogeneity and (5) recombinant Fab expressed from the heavy chain (HC) and the light chain (LC) V region sequences of MAbs should show comparable activity to the native antibody. Human MAbs of this type have now been isolated; two different thyroid stimulating MAbs (M22 and K1-18) and two different thyroid blocking MAbs (5C9 and K1-70) [4, 22–28]. The conventional methods of raising MAbs using immunisation with TSHR preparations were unsuccessful in producing antibodies that had the characteristics of patient serum TRAbs whether of the stimulating or the blocking types [4, 29]. Antibodies which bound to aa 381–385 were, however, quite effective in blocking TSHR stimulation by TSH [13–15] but not in blocking TSHR stimulation by TSHR autoantibodies . However, immunisation protocols using TSHR DNA were more successful and enabled thyroid stimulating MAbs to be produced in mice and hamsters [7–10]. This approach was also successful in producing the mouse MAb-B2 that acts as a powerful antagonist of TSHR stimulation by TSH and by patient serum stimulating TRAbs . In addition, a mouse MAb (CS-17) with the ability to inhibit TSH and TRAb stimulation as well as the constitutive activity of the cyclic AMP pathway has been produced using immunisation with adenovirus expressing the TSHR fragment aa 1–289 [30, 31]. CS-17 was more effective at suppressing TSHR constitutive activity (reduced by 60 % at 10 μg/mL) than inhibiting TSH binding to the receptor (reduced by 35 % at 10 μg/mL). Injection of CS-17 into mice was also reported to suppress the total serum T4 levels in vivo . In addition, a mouse MAb 1H7 with the ability to compete in a binding assay with TRAb-positive sera was produced by DNA immunisation of NMRI outbred mice with the human TSHR . TSHR binding affinity of 1H7 was in the 10−10 mol/L range as assessed by Scatchard analysis . Human TSHR MAbs (stimulating and blocking with the McLachlan & Rapoport characteristics) have all been produced so far using immortalisation of patients’ peripheral blood lymphocytes with Epstein–Barr virus, fusion with a heterohybridoma cell line followed by extensive cloning [4, 22, 23, 25–27]. The human MAb (M22) with powerful thyroid-stimulating activity was obtained from the peripheral blood lymphocytes of a 19-year-old male with Graves’ hyperthyroidism and type-1 diabetes mellitus [22, 23]. Serum TSHR autoantibody concentrations at the time of lymphocyte collection were 400 and 900 U/L by inhibition of TSH binding and stimulation of cyclic AMP assays, respectively . The blocking TSHR MAb 5C9 was isolated from the peripheral blood lymphocytes of a female patient with post-partum thyroiditis and high levels of TRAb (260 U/L measured by inhibition of TSH binding) [4, 25]. The donor patient serum inhibited the stimulating activity of TSH in CHO cells expressing the TSHR as well as having intrinsic stimulating activity, i.e., both TSHR agonist and antagonist activities were detectable in the donor patient serum [4, 25]. Another blocking TSHR MAb K1-70 was obtained from a female patient with a long history of autoimmune thyroid disease (AITD) who was clinically hypothyroid and positive for TRAb (160 U/L by TSH binding inhibition assay) at the time of the lymphocyte donation [26, 27]. The patient’s serum showed both stimulating activity and the ability to block TSH stimulation of cyclic AMP in CHO cells transfected with the TSHR [26, 27]. From the same lymphocyte preparation used to isolate the blocking MAb K1-70, a thyroid stimulating MAb (K1-18) was isolated, i.e., TSHR MAbs with different biological activities were obtained from the same blood sample [26, 27]. This observation provided the first direct evidence that stimulating and blocking-type TRAb can be produced by a patient’s B cells at the same time. This is consistent with the variations in some patients the symptoms of hyper- and hypothyroidism over time , with the clinical presentation depending at any one time on the relative concentrations and activities of the blocking and stimulating TRAbs as well as the ability of the thyroid to respond to stimulation by TRAb and TSH. The TSHR blocking MAbs 5C9, MAb-B2 and K1-70 have high affinity for the TSHR as assessed by Scatchard analysis, i.e., 4 × 1010, 2 × 1010 and 4 × 1010 L/mol, respectively [4, 12, 25, 26]. The TSHR blocking MAbs inhibit TSH-biotin binding to TSHR coated ELISA plates to different extents (Fig. 1a). K1-70 is the most effective inhibitor of TSH binding to the receptor with as little as 0.1 μg/mL giving 97 % inhibition, whilst 0.1 μg/mL of the mouse MAb-B2 gave 60 % inhibition and 0.1 μg/mL of 5C9 gave 35 % inhibition. The ability of the blocking MAbs to inhibit the stimulating activity of porcine (p) TSH (RSR Ltd), and patient serum TRAbs was assessed using CHO cells expressing the TSHR . The stimulatory effect of TSH, or sera on cyclic AMP production in the absence or in the presence of blocking MAb was compared. K1-70, MAb-B2 and 5C9 inhibited the stimulating activity of pTSH in a dose-dependent manner (Fig. 1b). The dose-dependent effects of the two human MAbs 5C9 and K1-70 were similar and caused complete inhibition of TSH stimulation to background levels at 1 μg/mL whilst MAb-B2 was less effective showing partial inhibition at 1 μg/mL and complete inhibition at 100 μg/mL. It is of interest to note that even though the two human MAbs (K1-70 and 5C9) give similar inhibition of TSH-induced cAMP stimulation, they show dose-response differences in their ability to inhibit TSH binding to the receptor (Fig. 1a, b). The blocking MAbs (5C9 IgG, K1-70 IgG, and MAb-B2 IgG) have the ability to inhibit the stimulating activity of patient serum TRAbs as assessed using CHO cells expressing the TSHR. Two separate studies indicated that in the presence of MAb-B2 and K1-70 (100 μg/mL final concentration), the stimulating activity of 31/31 and 15/15 Graves’ patient sera, respectively, was reduced to near basal levels [12, 25, 27]. In contrast, in the presence of 5C9, the stimulating activity of 29/31 Graves’ patient sera was reduced to near basal levels [4, 25, 27]. In particular, the stimulating activity of one of the discrepant serum was reduced to about 50 % in the presence of 5C9 IgG whilst the stimulating activity of the other discrepant serum was not affected. Further analysis of the discrepant serum that was unaffected by 5C9 and two stimulating sera that were affected by 5C9 was carried out using 5C9 IgG at different concentrations. The stimulating activity of two sera (which were blocked in the first experiment by all three MAbs) was inhibited to near basal levels by all three blocking MAbs with 5C9 and K1-70 showing similar dose-dependent effect whilst MAb-B2 was slightly less effective at the same concentrations as 5C9 or K1-70 (Fig. 2a–c). In contrast, in the case of the discrepant serum (which was not blocked by 5C9 in the first experiment), 5C9 IgG had no effect over a range of the concentrations studied whereas K1-70 and MAb-B2 showed almost complete inhibition of stimulating activity at 0.1 and 1 μg/mL, respectively. This experiment indicates that although stimulating autoantibodies in different patient sera interact with the same region of the TSHR, they do so in subtly different ways [25, 27]. Furthermore, this observation indicates that even though MAb-B2, K1-70 and 5C9 all inhibit binding of each other to the TSHR effectively [25, 27], the consequences of receptor binding by different blocking MAbs can be different. The TSHR, unlike other members of the glycoprotein hormone receptor family (follicle stimulating hormone receptor; FSHR, luteinizing hormone receptor; LHR or human chorionic gonadotrophin receptor; hCGR), is characterised by a relatively high constitutive (basal) activity of the cyclic AMP pathway in the absence of a ligand [32, 33]. This feature of the TSHR is likely to be related to the observation that a number of naturally occurring amino acid mutations in the transmembrane domain (TMD) are associated with the clinical presentation of non-autoimmune hyperthyroidism [34, 35]. The effect of the blocking MAbs on the constitutive activity of wild-type TSHR has been studied using a CHO-K1 cell line expressing approximately 5 × 105 TSHRs per cell [4, 25]. Although the constitutive activity of the wild-type TSHR was reduced in a dose-dependent manner by 5C9 IgG (71 % inhibition at 1 μg/mL of 5C9), it was unaffected by the blocking MAbs: MAb-B2 (0 % inhibition over a concentration range of 0.001–10 μg/mL; Fig. 3a) and K1-70 (0 % inhibition over a concentration range of 0.001–10 μg/mL) [4, 25]. In further investigations, specific mutations of TSHR residues reported to increase TSHR basal activity (S281I in the extracellular domain , I568T in extracellular loop-2 of the TMD , and A623I in intracellular loop-3 of the TMD ) were produced as previously described [4, 25, 30]. 5C9 was able to reduce the higher levels of constitutive activity associated with all 3 TSHR activating mutations studied (Fig. 3b–d). In the presence of 5C9 IgG at 1 μg/mL, TSHR S281I constitutive activity was inhibited by 60 % whilst in the presence of MAb B2 (1 μg/mL), only by 4 % (Fig. 3b). A similar response was observed in the case of the TSHR I568T activating mutation, the constitutive activity being inhibited by 74 % with 1 μg/mL of 5C9 and unaffected (0 % inhibition) by 1 μg/mL of MAb-B2 (Fig. 3c). In the case of TSHR A623I, the constitutive activity was reduced by 43 % by incubation with 1 μg/mL of 5C9 and unaffected by MAb-B2 (0 % inhibition; Fig. 3d). Increasing the concentration of 5C9 IgG further (concentrations up to and including 100 μg/mL) showed no further increase in the inhibition of cyclic AMP production in cells expressing the three activating mutations or wild-type TSHR. Overall therefore, the MAbs 5C9, K1-70 and MAb-B2 effectively inhibit TSHR stimulation by TSH and patient serum TRAb. However, only 5C9 was able to inhibit TSHR activity when no stimulating ligand was present (i.e., basal activity) in CHO cells transfected with wild-type TSHR or TSHR with different activating mutations. Consequently, 5C9 has at least two mechanisms of action: (a) preventing binding of activating ligand to the TSHR similar to MAb-B2 and K1-70 and (b) an effect on TSHR activity not dependent on activating ligand binding. A mouse MAb to the TSHR (CS-17) has also been reported to block both TSH-stimulated cyclic AMP activity and basal cyclic AMP activity in COS-7 cells expressing wild-type TSHR and TSHRs with activating mutations [30, 31]. Both 5C9 and CS-17 were able to inhibit the constitutive activity of TSHR S281I, TSHR I568T, and TSHR A623I at 1 μg/mL; however, 5C9 appears to be a more effective inhibitor than CS-17 at low IgG concentrations. The effect of various TSHR amino acid mutations on the biological activity of TSHR MAbs with blocking activity has been studied using CHO cells expressing wild-type or mutated TSHRs as described in detail previously [25, 28, 39]. Flp-In-CHO cells expressing either wild-type or mutated TSHRs were seeded into 96-well plates and used to test the ability of 5C9 IgG, MAb-B2 IgG or K1-70 IgG to block the stimulating activity of pTSH. In the case of the mouse MAb-B2, mutation of TSHR residues K58, R80, Y82 and K129 to alanine and TSHR mutations R80D, E107R, R109D and K129D resulted in a complete loss of the ability of MAb-B2 to block TSH stimulation of cyclic AMP production  (Table 1 and Fig. 4b) whilst MAb-B2 blocking activity was reduced when TSHR was mutated at R109 and F134 to alanine. Furthermore mutation of TSHR residues K58, I60, E61, Y82, R109 and K183 to alanine all caused reduction of K1-70 blocking activity  (Table 1 and Fig. 4c). Out of the TSHR mutations investigated, mutation of K129, D203, and F153 to alanine resulted in a complete loss of the ability of 5C9 IgG to block TSH stimulation of cyclic AMP production  (Table 1 and Fig. 4a) and TSHR mutations K183, E178, and E251 to alanine were associated with reduction of 5C9 blocking activity. In a different study, a mouse MAb 1H7  with TSH binding inhibiting activity and reactive with a conformational epitope on the TSHR was affected by single TSHR mutations at T56, K58, R80, Y82 and R109 and a triple mutation F130, G132 and F134 (mutations to the equivalent amino acid in the LH/CG receptor). These observations indicate that these MAbs with TSH antagonist activity (K1-70, MAb-B2 and 1H7) have overlapping binding sites on the TSHR and all three interact with TSHR amino acids K58, Y82 and R109 whilst the two mouse MAbs (MAb-B2 and 1H7) also interact with R80 and F134. In contrast, the TSHR binding region for human MAb 5C9, which has both antagonist and inverse agonist activity, overlaps with the binding sites of the other blocking MAbs but interacts with only one TSHR residue (TSHR K129) identified as important for MAb-B2 activity in the mutation studies. Furthermore 5C9 appears to interact with the residues located more C-terminally on the TSHR leucine rich domain compared to MAb B2 or K1-70. All the amino acid mutations that were found to affect the activity of the TSHR blocking MAbs are on the concave surface of the TSHR extracellular domain. This is in contrast to reports that the mouse MAb CS-17 [30, 31] which has both TSH antagonist activity and inverse agonist activity (similar to 5C9) interacts with amino acids on the convex surface of the TSHR (Y195 and S243) and Q235 on the concave surface. A series of TSHR mutations in the TSHR cleavage domain (CD; amino acids 282–409), in particular, E297A, E297 K, E303A, E303 K, R312A, K313A, E325A, D382A, D382 K, H384A, Y385A, and D386A some of which have been implicated in TSHR activation by TSH [15, 40–42] and TSHR mutations Y195, S243, Y148, K201, Y225, and E247 to alanine on the convex surface of the TSHR LRD have been produced in our laboratory. However, the ability of 5C9 to inhibit pTSH-induced stimulation of cyclic AMP production was not affected by any of the mutations in the TSHR CD or on the convex surface of the TSHR that were investigated. Consequently the mutation studies carried out to date indicate that the human blocking-type MAb 5C9 which has inverse agonist activity forms strong interactions with amino acids on the concave surface of the TSHR only. In addition, as mutations in other parts of the TSHR (i.e., the CD and convex surface of the LRD) had no effect on the activity of 5C9 it is likely that 5C9 forms either no or only weak interactions with amino acids in the TSHR CD implicated in TSH binding  or on the convex surface of the TSHR, implicated in CS-17 binding . However, it should be noted that the absence of an effect of TSHR mutations on 5C9 activity cannot discount entirely interactions with these residues . Overall, our experiments suggest that the interacting region for 5C9 on the TSHR is different to that of the CS-17 MAb although extensive mutation studies of amino acids on the TSHR concave surface or CD on CS-17 activity have not been reported. Recently, the crystal structure of a stable complex of a part of the TSHR extracellular domain (aa 22–260; TSHR260) with the antagonist MAb (K1-70) was solved at 1.9 Å resolution . The binding arrangement of K1-70 with the TSHR LRD can be compared to the binding arrangements of the thyroid stimulating human MAb M22 with TSHR260 in the crystal structure solved at 2.55 Å resolution  (Fig. 5). These solved structures also provide atomic level detail of the structure of the LRD of the TSHR [24, 28] and many of the interactions observed in the crystal structures have been confirmed by experiments involving mutation of TSHR or MAb amino acids [28, 39, 43]. TSHR260 has the shape of a slightly curved helical tube constructed from leucine-rich repeat motifs. It has opposed concave and convex surfaces, with an 11-stranded β-sheet located on the concave surface (10 parallel strands, 1 per repeat and an antiparallel strand at the N terminus; Fig. 5). The structure of the convex surface of the TSHR LRD presents eight small strands (two residues each) forming two 3-stranded β-sheets and one 2-stranded β-sheet (Fig. 5). The inner surface of the tube is lined with hydrophobic residues and there are no α helices in the TSHR LRD structure. All five glycosylation sites (N77, N99, N113, N177, and N198) are located on the convex surface of the TSHR LRD and are glycosylated. The FSHR is the closest homologue to the TSHR with 40.9 % amino acid sequence identity . The crystal structure of the FSHR LRD in complex with FSH has been solved at 2.9 Å resolution . The root mean square deviation (rmsd) on Cα core atoms between the TSHR260 and FSHR LRD structures is 1.1 Å providing the first detailed evidence that the LRDs of the two receptors have very similar structures . Furthermore, a comparison of the structures of TSHR260 in complex with K1-70 or with M22 shows an rmsd on all Cα atoms between the structures of 0.51 Å thus confirming the solved structure of the TSHR260 originally reported [24, 28]. In addition, the higher resolution TSHR260–K1-70 structure provided details of disulphide bond arrangements at the N terminus of the TSHR (Fig. 5). Disulphide bonds are present between the first and second cysteines (C24 and C29) and between the third and fourth cysteines (C31 and C41). In the original TSHR260-M22 structure, only the C31 and C41 disulphide bond was visible due to disorder in the structure of the extreme N terminus of the receptor. The TSHR N-terminal disulphide bonding arrangements are different to those observed in the FSHR crystal structure, where the first and third cysteines (C18 and C25) and the second and fourth cysteines (C23 and C32) are disulphide bonded . The TSHR has a three-amino acid insertion between TSHR C31 and C41 which is not present in the equivalent position in the FSHR sequence, consequently bonding between C29 and C41 of the TSHR would be entropically less favourable than between the equivalent FSHR cysteines. Earlier studies based on mutagenesis proposed that TSHR C41 was paired with either C29 or C31 , however, the most recent crystal structure of the TSHR  now shows the actual molecular details of cysteine pairing at the TSHR N terminus. In the crystal structure, the blocking antibody K1-70 shows no interaction with the extreme N terminus of the TSHR LRD (aa 22–34), but forms contacts with residues D36 and R38 (distance < 4 Å) of the first repeat of the TSHR LRD (aa 35–52); . Molecular replacement analysis of the interaction of M22 with the TSHR (using the TSHR LRD structure from the complex with K1-70 solved at 1.9 Å) also showed that there were no M22 interactions involving the extreme N-terminal region of the TSHR LRD with the first contact amino acid residue being R38 (distance < 4 Å) of the first repeat. K1-70 binds slightly more N-terminally to the first TSHR repeat than M22 and this may account for the improved order of the extreme N-terminus in the TSHR260—K1-70 crystal structure. These observations suggest that the TSHR region containing the four disulphide-bonded cysteines does not have a major role in TSHR autoantibody binding. For example, it has been proposed [45, 46] that the TSHR N-terminal region (aa 22–41) is part of a highly conformational epitope for thyroid stimulating autoantibodies. However, a more recent study using a mutated TSHR, with the first 30 amino acids removed, confirmed the binding arrangements observed in the TSHR260-M22 crystal structure, i.e., that the stimulating antibody M22 does not interact with the extreme N terminus (aa 22–34) of the TSHR . The N terminus of the TSHR most likely acts as a protective N-terminal cap aiding stability, preventing degradation and keeping the LRD in its correct conformation [48, 49]. The crystal structures of the two antibodies in complex with the TSHR show numerous strong interactions (hydrogen bonds, salt bridges, polar or hydrophobic contacts, Van der Waals interactions) between the antibody HCs and LCs and residues on the concave surface of TSHR260. This strong network of interactions is consistent with the high binding affinity of M22 and K1-70 to the TSHR. Table 1 and Fig. 4 show a comparison of the TSHR residues that were identified as important for the activity of 5C9 and MAb-B2 by TSHR mutation experiments and the K1-70 and M22 TSHR contact residues confirmed by analysis of crystal-structure data (residues that were identified as important for the activity of M22 and K1-70 by TSHR mutation experiments are marked with an asterisk in Table 1) . The residues of TSH that interact with the TSHR LRD were obtained by comparative modelling [50–53] and are shown in Table 1 and Fig. 4 for comparison with the MAb–TSHR interactions. As shown in Table 1, there are a number of the same TSHR residues that are important for the activity of more than one MAb. In particular, TSHR K129 is important for interaction of all four MAbs (5C9, MAb-B2, K1-70, and M22) whether they have antagonist, inverse agonist, or agonist activity and this is consistent with the observation that even though the antibodies have different functional activities, their binding sites on the concave surface of the TSHR overlap [24, 25, 28, 39]. However, the antagonist MAb-B2 contact residues are located more N-terminal on the TSHR concave surface. Furthermore, seven of the eight TSHR residues identified as important for the activity of MAb-B2 also interact with the antagonist K1-70 MAb (observed in the crystal structure). Remarkably, the crystal structures of the TSHR complexed with the antagonist MAb K1-70 and the agonist MAb M22 show that 16 TSHR residues (D36, R38, K58, R80, Y82, H105, E107, R109, N110, K129, F130, D151, F153, I155, E157, and K183) interact with both MAbs. An extensive overlap is also evident between the TSHR residues predicted to be involved in TSH interaction with the receptor and those involved in binding of the four MAbs to the TSHR. Identification of TSHR interacting residues from crystal structures of TSHR complexed with the MAbs provides more accurate information compared to TSHR mutation experiments. For example, a mutation may not show any effect on the biological activity of an antibody if other interactions with the TSHR are not disrupted and are strong enough to compensate for the mutation. However, in most cases, the experimental mutation results are in good agreement with the binding arrangements observed in the crystal structures [24, 28, 39, 43]. Overall, the data obtained from the crystal structures and mutation experiments suggest that although the binding sites of the MAbs on the concave surface of the TSHR overlap with each other, their functional effects are likely to be defined by subtle differences in the actual amino acids contacted. In vivo effects of K1-70 on thyroid function were studied in rats which have naturally high serum TSH and consequently high serum T4 levels (unsuppressed rats). These high levels of serum TSH and T4 can be suppressed by providing rats with T3 in their drinking water for a few days (T3 suppressed rats). Intramuscular injection of different concentrations of the blocking MAb K1-70 into unsuppressed rats caused a dose-dependent decrease of total and free T4 levels. The total and free T4 concentrations decreased to their lowest levels at 24 h post injection (Fig. 6a) and this coincided with the maximum levels of K1-70 IgG measured in the same samples. Doses of 100 or 200 μg per animal of K1-70 IgG caused a decrease of the serum total and free T4 to the low levels observed in T3 suppressed rats (Fig. 6b). In contrast, intramuscular injection of different amounts of M22 IgG into T3 suppressed rats caused a dose-dependent increase in total and free T4 concentrations. The maximum concentrations of total and free T4 in the rat sera were detected at 24 h post injection and coincided with the peak in the levels of M22 IgG measured in the same rat-serum samples (Fig. 6c, d). Furthermore, administration of K1-70 IgG at 200 μg per animal caused complete inhibition of the stimulation of the rat thyroid in vivo by M22 IgG (4 μg per animal) when injected 3 h before the M22 or 3 h after the M22 or at the same time as the M22 (Fig. 6e). These experiments showed for the first time that a blocking-type MAb can act in vivo as an effective inhibitor of thyroid stimulation by TSH and TRAb. The ability of K1-70 to inhibit autoantibody stimulation of the thyroid in vivo emphasizes its potential as a new type of anti-thyroid drug. Biotinylated TSHR MAbs (K1-70 and M22), a human MAb to thyroid peroxidase (2G4, positive control ) and a negative isotype control antibody (human IgG1 lambda) were analysed for binding to cryo-sections of human thyroid fixed in acetone and methanol using standard procedures. In addition, cryo-sections of human prostate, cerebellum, kidney and liver were used in the experiments as negative control tissues. 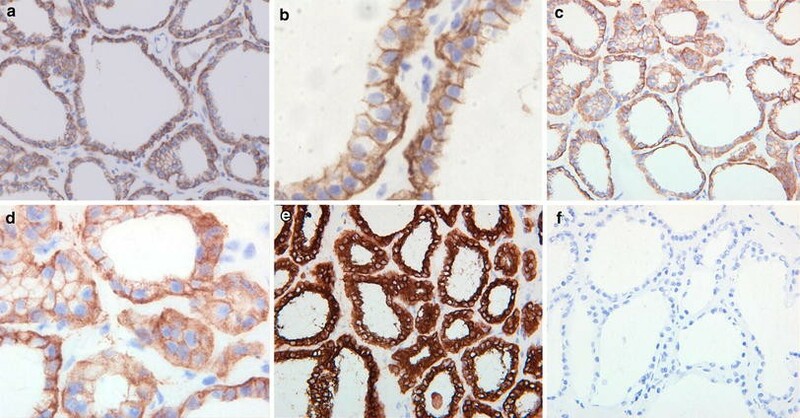 Immunohistochemical staining of human thyroid tissue with biotinylated TSHR MAbs K1-70 or M22 showed uniform, strongly positive staining of the entire external surface of thyroid follicular epithelial cells (Fig. 7a, b). The observed pattern of staining is consistent with the presence of the TSHR on the basal membrane of thyroid follicular epithelial cells. The reactivity with M22 IgG was observed over a range of concentrations with minimal specific positive staining evident at 0.078 μg/mL, mild specific positive staining at 0.313 μg/mL, moderate at 2.5 μg/mL and heavy at 10 μg/mL. The intensity of thyroid cell membrane staining with K1-70 IgG was similar at the same concentrations as M22 IgG. There was no difference in the staining pattern observed for the TSHR MAbs K1-70 and M22 in experiments on normal human thyroid sections. Consequently the two human MAbs with similar binding affinity for the TSHR but with different biological activities (stimulating MAb M22 and the blocking MAb K1-70) show very similar reactivity to the TSHR by immunohistochemistry. Human MAb 2G4 reactive with thyroid peroxidase showed specific positive cytoplasmic staining of human thyroid tissue in the immunohistochemistry experiments (Fig. 7c). The cytoplasmic staining pattern with 2G4 IgG differed from the membranous staining pattern with M22 IgG or K1-70 IgG consistent with predominant expression of thyroid peroxidase in the thyroid cell cytoplasmic compartment and expression of the TSHR on the cell membrane. There was no specific staining of human thyroid tissue with the biotinylated isotype control MAb (Fig. 7d). Biotinylated M22 IgG, K1-70 IgG or 2G4 IgG showed no specific staining with a selected panel of normal human tissues (prostate, kidney, liver and cerebellum) in control experiments. Specific TSHR staining on normal human thyroid sections at the basal pole of the thyroid cells was reported previously using a mouse MAb reactive with a conformational epitope on the extracellular domain of the TSHR . In a different study, more cytoplasmic rather than membranous staining was observed in sections from 2/3 human thyroid glands using a mouse MAb reactive with the N terminus of the TSHR  whilst a MAb binding to the TMD of the TSHR showed predominant reactivity with the basolateral surface of thyroid cell membrane . In addition, some mouse MAbs have been reported to bind to the TSHR in sections of orbital fat from patients with Graves’ associated ophthalmopathy but not normal control orbital fat . The ability of both K1-70 and M22 to bind specifically to the TSHR on thyroid tissue sections suggest potential applications of these MAbs in detection and visualisation of the TSHR in thyroid sections from different species as well as other tissues such as orbital fat or bone [58, 59]. Furthermore, the ability of our human MAbs to bind strongly and specifically to the TSHR on thyroid epithelial cells indicates that appropriately labelled M22 and K1-70 are likely to have potentially important applications in in vivo imaging. For many years, the control of thyroid over-activity has relied on inhibiting thyroid hormone synthesis with antithyroid drugs (ATDs), reduction of thyroid volume by surgery (subtotal thyreoidectomy) or destruction of the thyroid gland with radioactive iodine [60–62]. In particular, the pharmacological approach for controlling hyperthyroidism has not changed since the introduction of ATDs in the 1940s . Overall current treatment options provide effective control of the symptoms of the pathogenic effects of TRAbs in the majority of patients. However, treatment strategies that act at the beginning of the pathogenic pathway preventing the binding of TRAbs to the TSHR and/or acting directly on the TSHR to inhibit the unwanted biological activity of TRAbs seem more appropriate but are not currently available for clinical use. TRAbs with TSHR antagonist activities are “natural” inhibitors of TSHR stimulation by both stimulating TRAbs and TSH. Consequently antibodies such as human MAbs K1-70 and 5C9 or the mouse MAb-B2 could be used to control thyroid over-activity in Graves’ disease. K1-70, 5C9 and MAb-B2 have the ability to inhibit the stimulating activity of TSH and patient-serum-stimulating TRAbs in CHO cells expressing the TSHR (Figs. 1 and 2). Furthermore, the potent inhibiting effect of K1-70 IgG on thyroid hormone secretion has been shown in vivo (Fig. 6b). In addition, in vivo studies have indicated that K1-70 IgG effectively inhibits M22 thyroid stimulating activity (Fig. 6e). The effects of K1-70 on endogenous TSH and M22 stimulated thyroid hormone levels were evident within a relatively short time after administration. These observations open new opportunities for the management of Graves’ disease. In particular, relatively quick effects of K1-70 in vivo suggests that the euthyroid state may be achieved earlier in patients than with currently used therapies particularly ATD. Consequently, using a powerful TSHR blocking-type MAb as a first-line treatment should lead to an improvement in the ability to control the course of Graves’ disease [64, 65]. Furthermore, blocking-type TSHR MAbs would have a particular application when quick control of thyroid over-activity is essential as in a thyroid crisis . In addition, patients who do not tolerate or do not respond well to ATDs may well benefit from treatment with blocking-type MAbs [60–62]. Another potential application of blocking-type TSHR MAbs would be in controlling thyroid over-activity in pregnant women. In this application, K1-70 Fab that has similar TSHR antagonist activity as intact K1-70 IgG , and does not cross the placenta would act on the thyroid of a mother without affecting the baby’s thyroid. Almost 90 % of patients with Graves’ disease present with eye signs, and in approximately 5 %, the symptoms are serious and require special interventions . TSHR expression has been demonstrated in orbital fibroblasts and preadipocytes, and furthermore, evidence of humoral and cellular autoimmune responses to the TSHR in the orbit has now been shown [58, 59, 66, 67]. Consequently, it is likely that autoimmune responses against the TSHR expressed in the orbital tissues are involved in the pathogenesis of Graves’ ophthalmopathy [58, 59, 66, 67]. In most cases, the symptoms of ophthalmopathy resolve with the control of thyroid over-activity. In severe cases, the treatment is based on controlling the symptoms and preventing optic nerve damage by use of glucocorticoids, orbital irradiation or surgical decompression. More recently, trials with rituximab, a MAb against the CD-20 antigen on B cells have shown some encouraging results . However, treatment with rituximab is not targeted specifically at the mechanisms involved in the pathogenesis of Graves’ ophthalmopathy and may have harmful side effects [68, 69]. Blocking-type TSHR MAbs, however, are potentially useful therapeutics for the management of Graves’ ophthalmopathy. It may well be that preventing TSHR activation in orbital fibroblasts early in the disease process would have an effect on the complex autoimmune and inflammatory responses in the orbit [66–69]. If successful, blocking-type TSHR MAbs would provide for the first time a specific treatment for patients with this debilitating condition. It has been suggested that the autoimmune/inflammatory responses to the TSHR on fibroblasts may have a role in the pathogenesis of pretibial myxedema and it has been proposed that the mechanisms involved in the development of pretibial myxedema and ophthalmopathy are similar, i.e., not dependent on site-specific properties of the fibroblasts . It may be that blocking-type TSHR MAbs would be helpful in the management of pretibial myxoedema. In most cases, clinical hyperthyroidism is caused by the stimulating effect of TRAbs. However in some cases, thyroid overactivity is the result of autonomous secretion of TSH by pituitary adenomas . Blocking-type TSHR MAbs such as K1-70, 5C9 or MAb-B2 would be expected to be effective in preventing thyroid hormone production in response to the excess of autonomously produced TSH by specifically inhibiting TSH binding to the receptor. 5C9 MAb with its ability to inhibit TSHR constitutive activity would also be expected to be effective in controlling thyroid over-activity associated with at least some TSHR-activating mutations [34, 35]. The mouse MAb CS-17 appears to have similar properties to 5C9, but use of CS-17 in patients would depend on its successful “humanising” [72, 73]. Treatment options with 5C9 (or humanised CS-17) should be valuable in patients with familial non-autoimmune hyperthyroidism. In addition, patients with toxic nodular goitre awaiting the effects of radical treatment (surgery or radioiodine) would likely benefit from blocking-MAb reduction of TSHR-activity and toxic effects of thyroid hormones on the cardiovascular system [60–62]. Furthermore, suppression of TSHR constitutive activity with 5C9 (or humanised CS-17) would be expected to be of benefit in patients with thyroid cancer . The important goal in the treatment of thyroid cancer is complete TSH suppression to eliminate potentially cancer-growth-promoting TSHR activity. However, the means to control constitutive TSHR activity in the absence of TSH are not currently available and these MAbs with TSHR inverse agonist activity would be good candidates. The observation that human MAbs to the TSHR bind specifically to TSHRs on thyroid epithelial cells in immunohistochemistry studies provides a rational basis for using M22 or K1-70 for in vivo imaging applications. These applications may be particularly useful in thyroid cancer and thyroid-cancer metastases localisations in vivo. K1-70 which has equal ability to bind to the TSHRs on the thyroid cells as M22 without causing stimulation of cyclic AMP would be an appropriate choice for imaging purposes. Furthermore, TSHR MAbs such as K1-70 could be used to deliver drugs directly to the site of thyroid tumours expressing the TSHR. For example, an active compound selected from drugs known to have chemotherapeutic effects could be linked to the MAb or the MAb could be linked to a metal chelator carrying a radionuclide for targeted therapy . Consequently, availability of blocking-type TSHR MAbs should provide new in vivo diagnostic and therapeutic tools for clinicians caring for patients with Graves’ disease, patients with thyroid cancer and patients with other thyroid diseases who would benefit from the control of TSHR activity. All authors are employees of RSR Ltd. RSR Ltd is a developer of medical diagnostics including kits for measuring thyroid autoantibodies.